We have all done to-do lists. Somehow there never seems to be enough hours in the day to accomplish all the things on your to-do list. Here is a system that works -- and it can work for you too. Making a "things to do list" is not enough. You have to rank them. You have to know which tasks are more important so you can focus on them. Then you have to allocate resources to those items, measure your progress, and reward yourself for your successes. List all your to-do items in a spreadsheet, although you can also do them on paper. You also can put them on your computer or smartphone, write them on your calendar, or input them to a time management software. The first step is to list all you have to do. Then assign a rank to them so you can focus on the important items. Use an A, B, C ranking. The A-list is the things I have to get done today before I leave. The B-list is things you need to get done, but not necessarily today. Finally, the C-list is the things you need to find time to do soon. You may find out pretty quickly that things on the C-list, and even the B-list, just never get done. In one Operations Manager position several years ago, I found myself getting more and more frustrated with my A-list. Not only was I not getting through it every day, as I always had before, but the A-list kept growing. 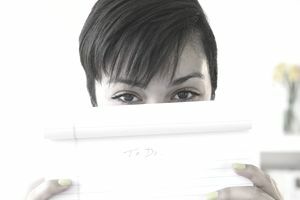 That's when I figured out what I had to do to make my to-do list work for me, and I developed a system that did work. It wasn't enough to know what was important; what made the A-list. I also needed to know how long things would take and how much time I had to devote to them. I added a column to my to-do list with the estimated time each task should take and an adjacent column with the cumulative total. Then I did a simple time study. As I did each task I wrote down what I did and the start and end times. I kept track for an entire day. Then I repeated it a couple weeks later on a different day. It wasn't an exhaustive survey by any means, but it gave me some insight. As the Operations Manager, much of my day was taken up by interruptions - dealing with events that happened, crises that came up, or problems that had to be solved. On average these interruptions consumed four hours a day. Since I typically work a ten-hour day, that left me six hours a day for the things on my to-do list. Each night, before I left the office, I would update my to-do list. I would delete the things that I had completed, delegated, or downgraded, add the new things that had come up, rearrange the priorities to get the most important tasks on top, and assign estimated time to each. Then I'd go down the list to the six-hour mark and draw a line. That became my target for the next day. Most often, that line fell somewhere on my A-list. Seldom was it anywhere near the bottom. However, that was my goal. If I hit or passed the line, I went home feeling like it had been a productive and successful day. Instead of beating myself up over the things I hadn't been able to get to, I acknowledged my success at having met or beaten my goal. The next day, I had to start all over again and reach for the new goal, but I did it from the perspective of building on previous success rather than from the frustration of constantly having more to do than I had time to accomplish. To be successful, you have to develop a system to manage your time so you can get more done in the time you have. If your target line on your to-do list is always near the top, your boss is going to start looking for someone else who can work a little farther down the list every day. Below, check out a few resources to help you do a better job of time management. List the tasks you have to do. Prioritize those that are important, not just urgent. Have a plan for what to accomplish each day. Work toward that plan. Reward yourself when you meet or beat your goal.